Time at the spa is a great way to treat yourself to a multitude of health benefits, as well as remove harmful toxins from your body. But between travel costs and membership fees, your expenses can add up quickly. Thankfully there is a solution to your woes: buying a portable infrared sauna. When shopping for the best portable infrared sauna its really important to look for low EMF models. Low EMF portable saunas will maximize your health benefits while also minimizing radiation exposure. That’s why we offer you our take on the best low EMF portable infrared saunas. Each type of infrared sauna offers different function, strong points, and controls that will contribute to your overall satisfaction. Which portable infrared sauna will fit you and your home, while also providing you with the most health benefits is going to depend on your needs. We reviewed the top portable infrared saunas on the market so you can find exactly what you prefer. This is the most expensive portable sauna we reviewed and it is easily one of the best performers. Relax Sauna produces only the very best of quality infrared saunas, with 95%-100% far infrared, resulting in pain relief and purifying detoxification. The way the heat is distributed throughout the Relax Sauna is both unique and very smart. The relax sauna uses forced air from two far infrared blowers located at the bottom front of the portable sauna. Each blower has a 750 Watt output and circulates the infrared heat within the sauna. When compared to radiant panel designs, the Relax Sauna heats up faster and minimizes EMF exposure due to the generator placement. 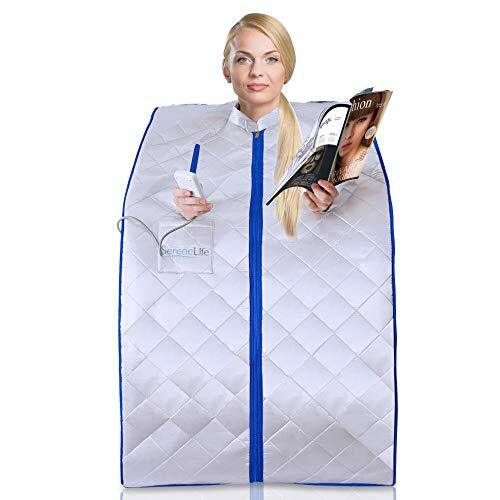 And if you open the zipper, this infrared sauna maintains consistent temperatures much better, as opposed to the slower warm-up of radiant panels. This Relax Sauna features unique infrared technology with 40 patented ceramic chips that you will only find in a Relax far infrared sauna. These ceramic chips are tuned to emit far infrared within a frequency range of of 4.4 to 14.4 microns, which is exactly why this infrared sauna provides unique benefits. This frequency range provides the perfect environment for the body to absorb infrared and allows this portable sauna to maximize your core temperature while also increasing your metabolism. Because of this infrared technology, this portable sauna emits remarkably high and clean levels of infrared. You also get the other benefits that accompany far infrared technology, such as boosting your circulation, and building-up your lymphatic system. If you want to get a good sweat, the relaxing heat of this portable sauna will have a lot to offer. This low EMF sauna cranks out 1500 watts of far infrared energy and heats up much faster than other portable saunas. The Relax Far Infrared Sauna comes up to temperature in less than 30 seconds, so you won’t be wasting time waiting around. Beyond the detoxifying health benefits of the portable infrared Relax Sauna, you will also experience the beautifying and anti aging benefits. Plus it promotes faster weight loss, lower blood pressure, and better circulation. Other helpful benefits include excellent treatment of chronic conditions like limes disease and arthritis. The cleansing and detoxifying ability of this infrared sauna promotes wound healing as well as the release of stored heavy metals within the body. One of the huge benefits of the far infrared heat within this Relax Sauna is that it keeps EMF levels really low. Now, we mean that quite literally. The Relax Sauna produces extremely low magnetic field exposure due to the design, as well as the low placement of the far infrared generators. EMF readings show that this unit generates nearly no magnetic field whatsoever above your lower legs. EMF readings measured in milligauss from the chair position come in at ~0.17 mG. Realistically, it’s worth noting that your EMF meter is also likely to pick-up background magnetic fields from outside the unit as well. But 0.17 mG is well below anything of concern. Overall, this portable infrared sauna doesn’t disappoint. With very low EMF, excellent health benefits, high temperatures, quick warm-up time, and a myriad of features you won’t find in other portable saunas, the Relax Far Infrared Sauna get our stamp of approval. This is another feature-rich, super low EMF infrared sauna that offers you portability while also providing all the terrific health benefits you need. The Durherm low EMF infrared sauna is right near the top of our list. You’ll find a lot of value and function this infrared sauna provides to people who need great performance that won’t take too much space. This portable far infrared sauna offers the lowest EMF testing results we have found. If you have an EMF hyper-sensitivity and are looking for a lowest-of-the-low EMF portable sauna, this is going to be the best infrared portable sauna you will find. Another strong point of the Durherm Low EMF Infrared Sauna is the three separate FIR sauna heaters. The FIR sauna heating panels are constructed from ultra thin Japanese made Tourmaline panels that emit both infrared waves and negative ions. A lot of thoughtful design went into this portable infrared sauna as well. First of all, it has a larger internal cabin than other portable saunas, so you can have a little more room for movement, or to extend your legs a bit. When you are finished, the portable sauna folds up into a small package so you can store it away. Ports on the top and front of this infrared sauna provide your head and hands freedom of movement for reading, watching TV, or listening to music, etc. The Durherm Low EMF Infrared Sauna also comes with a comfortable terry cloth neck cushion that can be easily removed for washing. As a bonus, they even provide an extra neck cushion. Since there are three tourmaline FIR panels, that means shorter warm-up time and less waiting around. The surface temperature on the heat panels ranges from 104-140 degrees Fahrenheit. That is plenty of heat, and you should be experiencing a good drenching sweat in about 20 minutes. The wired handheld controller allows you to make temperature adjustments without opening the sauna, and also set a timer when desired. Time settings are adjustable in increments of five minutes, and range from five up to sixty minutes. Also included with this portable infrared sauna, you receive a heated foot-pad and a folding sports chair. The tourmaline FIR panels that heat the Durherm Low EMF Infrared Sauna are known to aid in the detoxification process, and they also produce vastly lower levels of EMF when compared to other panel heating designs on the market today. Levels of EMF range from 5-15 milligauss, which is extremely low compared to other panel-heated portable saunas on the market. If you are in the market for an infrared portable sauna that minimizes EMF’s while maximizing comfort and features, we are sure that the Durherm Low EMF Infrared Sauna will exceed your expectations. With some portable saunas tipping the scales at over $1000, this low EMF infrared sauna can save you some cash while still providing great results. The Radiant Saunas BSA6315 offers nearly all the same features of high-end portable IR saunas at a fraction of the price. Yes – the portable infrared saunas above offer lower EMF readings, but this sauna off-sets that minor difference with comfort, reliable results, and by saving in energy costs as well. This infrared sauna can also accommodate all body types due to the oversized design. Individuals pursuing healthier living and weight loss can benefit greatly from the many other health benefits provided by this infrared portable sauna as well. Lets dig a little deeper into the features and details. This spacious portable sauna offers many of the features you would expect of a high-end infrared sauna, but obviously at a fraction of the price. With super fast setup and heating times, you can squeeze in a great sauna therapy session any time. Even though this infrared sauna folds down to a minuscule 41.33-in L x 33-in W x 5.11-in H, when in use it is designed to accommodate individuals up to 6 feet 5 inches tall! That’s something you won’t find in many portable infrared saunas. The front of this sauna features compartment zippers for accessing the sauna as well as extending your hands and arms as desired. On the face of the cabin, you are provided two storage pockets that are perfect for storing the fingertip hand held controller, or any other items you might want within reach. With one warming panel on each side, and two more on the rear, this portable infrared sauna warms up quickly. After the first initial use, you will find this portable sauna gets hot in about 5-10 minutes. And the four warming panels will provide you with a good sweat within 20-30 minutes. We really like the chair that is included with this model. It has a much more robust and comfortable design when compared to some of the other chairs that are usually offered. One feature that makes this chair different is the padded arm rests. That might seem somewhat trivial, but it is just more comfortable spreading out a bit. We didn’t see any stated manufacturers specifications regarding EMF levels for this sauna. With that said, this infrared sauna is ETL approved for low EMF levels, so you can be sure that EMF readings won’t exceed 2.5 milligauss. Testing with an EMF detector shows readings dropping below 2 mG when you are 3 inches or more away from the emitters, meaning the chair position has very low EMF readings. If you are looking for an affordable, low EMF portable infrared sauna, the Radiant Saunas BSA6315 has exactly what you are looking for. With great features you’ll only find in higher-end models, you won’t be disappointed with this low EMF portable sauna. Do you drive to the spa maybe once a week? And what are the membership fees? Maybe $10-$15 each time you go? Lets just do the math conservatively for a minute. 52 weeks x $10 = $520 That’s your cost for one year at the spa! Of course, you get the health benefits of your time there, but you certainly don’t get to take the sauna home with you at the end of the year. The SereneLife Portable Infrared Spa can save you the wasted time of driving to the spa, and paying the expensive membership fees. This is one of the big advantages of the SereneLife Portable Infrared Sauna. Within just a few months, you are saving money. You can use it in the convenience of your own home. But you can also take it with you outside the home as well. As you might expect, this portable infrared sauna features a wired remote so you can adjust your settings as needed. The remote features an automatic heat setting and a timer that provides up to 60 minute therapy sessions. Zippered openings on the face of the portable sauna allow you to read, or have a cold drink while you are enjoying your time in the heat. These openings close up tightly so you can keep the heat trapped inside for those intense sweat sessions. When comparing this portable infrared sauna with the others we reviewed above, one place that heat often escapes is around the collar. For the price, we thought that was a minor weak point that can easily be remedied by wrapping a towel around the collar. This unit cranks up to it’s maximum temperature of 140 degrees Fahrenheit in less than ten minutes. That’s really quite fast for such an affordable infrared sauna. 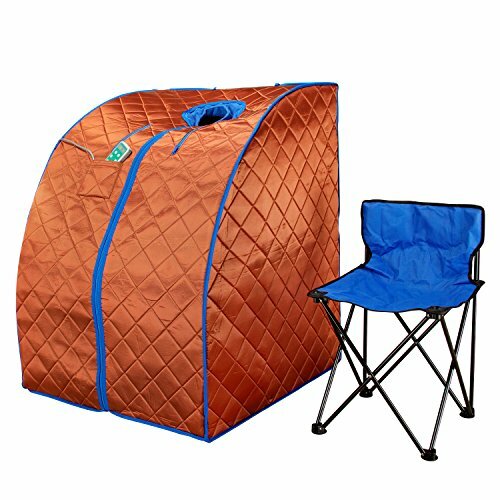 This portable sauna also packs up really small and only weighs 20 lbs, so you’ll have no problem moving it and storing it away when finished. The Environmental Protection Agency recommends limiting EMF exposure to 0.5 mG to 2.5 mG. For example, when you are three feet away from a microwave, you are exposed to up to 25 mG.
With that in mind, we looked to the EMF readings provided by verified buyers of this portable infrared sauna. You will find mixed reviews regarding EMF levels, but our findings showed EMF levels peaking at ~2.4 mG. If you have an EMF hyper-sensitivity and those levels might bother you, we suggest considering either the first or second low EMF portable infrared sauna we reviewed above. Copyright © 2019, mpemf.com. All rights reserved.